It is well known that individuals with autism spectrum disorder (ASD) have difficulties in social interactions. However, the biological causes of these difficulties are not well understood. 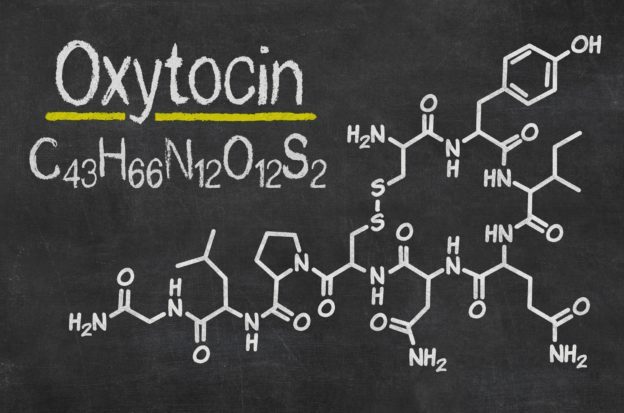 In the brain, many social and associated behaviors are modulated by the release of a chemical compound called oxytocin1. Researchers have hypothesized that social deficits in ASD may result from an imbalance in the system that regulates oxytocin in the brain. Scientists are still debating the role of oxytocin in ASD. Earlier studies have suggested that individuals with ASD have lower levels of oxytocin in their blood than individuals without ASD2, but recent research did not confirm this difference. In fact, researchers suggested that oxytocin is associated with social skills in both individuals with or without ASD, so that higher levels of oxytocin correlate with better performances in social communication tasks3. These findings have encouraged researchers to think about new ways oxytocin levels may be artificially increased, with the hope to improve social difficulties in ASD. One such method involves using an oxytocin spray intra-nasally. Results from studies that tested the effects of oxytocin administration showed that individuals with ASD perform better at social tasks after getting oxytocin4. However, clinical trials have not reached a consensus on the use of oxytocin as a potential treatment5,6. These studies suggest that, while oxytocin may be a promising candidate for therapeutic treatment in ASD, more research is needed to better understand how oxytocin affects social behavior in ASD, and, most crucially, how it acts in the brain of individuals with the disorder. Opportunities to research this further may come from examining oxytocin concentration in post-mortem brain tissue. By comparing brain specimens from individuals with ASD and individuals without ASD, a new study7 revealed that the tissue from individuals with ASD presented changes in the density of oxytocin receptors—the protein structures that help modulate chemical signaling generated by oxytocin in the brain. The study, which was led by Karen Bales and her collaborators at the University of California-Davis, found differences in oxytocin receptors in areas of the brain, such as the ventral pallidum (VP) and nucleus basalis of Meynert (NBM), which are known to be implicated in the regulation of attention, eye movement and gaze direction—functions that are important to understand social interactions. In addition, the authors reported that oxytocin quantity decreased with age, so that higher concentrations were found in the brain of the youngest individuals. Because this pattern was observed in the brain samples derived from individuals without ASD, but not in the brain samples from individuals with ASD, the researchers suggested that disruption of oxytocin-related mechanisms may occur in early childhood. More research is needed to support these initial findings. The study, which used brain tissue acquired from the University of Maryland Brain and Tissue Bank, a Brain and Tissue repository of the NIH NeuroBioBank, is among the first that measured oxytocin receptors in the human brain, including individuals with ASD. Using post-mortem tissue was crucial to help the researchers make a step forward towards understanding the biological role of oxytocin and make hypotheses on when oxytocin regulation may be affected in ASD.